Hello from the mountains ! Today's idea is a paper Christmas wreath where you could insert a small card to hold a gift card ! The cut is made at size 6 1/4" to fit the gift card, and instead of the scalloped card of the cartridge, I just fold in half a rectangle of gray paper and embossed it with a Cuttlebug folder to hold the gift card. 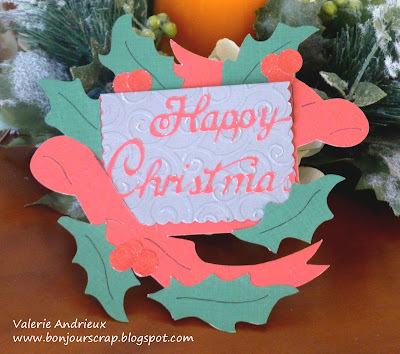 The papers I used here came from the Winter and Christmas cardstock stack by DCWV. 5 more days for me to create and for you to participate in my giveaway. Just comment on one or several posts between the 9th and 24th of December and follow my blog to enter the giveaway and you could win a 12x12 stack by DCWV ! This one makes me wish I had a Cricut. However your idea is inspiring, and I am sure I can find a wreath cut file for my cutter and use your idea in a similar fashion. Hope you enjoy your stay in the mountains. What a clever gift card holder design! I love that you would be able to see parts of the gift card through the spaces in your wreath. Fun non-traditional colors too. Have a wonderful time in the mountains and enjoy the holidays!